The ECSA Working Group on Citizen Science and Open Science has been working over the past year with support from DITOs to produce an overview of the two fields of Citizen Science and Open Science, and to come up with recommendations for further actions. Are you a practitioner or a scientist working in one of the fields, or do you just want to find out more about these two upcoming areas, be sure to take a look at the Policy Brief. 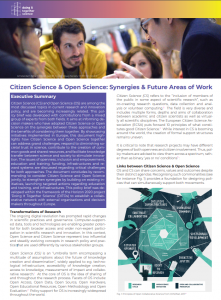 Not only are the links between Citizen Science and Open Science discussed in more detail, the Policy Brief also elaborates on future challenges and ways to deal with those. Four case studies of existing initiatives in Europe who link characteristics from both CS and OS are included, and more can be found on the website. You can find the policy brief here.